To give presentation in the annual meeting of CSJ, you need to follow the procedure below. The deadline of each procedure is not yet fixed. Click here to check the fixed date. 2Registrate for the Presentation - Notification of Presentation No. To give presentation in the annual meeting of CSJ, registrant and the speaker must be a member of CSJ (includes　educational members) at the point of registration. (You don't have to be a member, only if you are giving presentation in Advanced Technology Program. )* If you wish to nominate for CSJ Presentation Award for Industries, you must be a member. STEP2. Registrate for the Presentation - Notification of Presentation No. Check the overview of application before registrating for the presentation and check the folowing schedule. Register from the presentation's registration form during the period above. You will receive the ID and the password to login to your meeting's MYPAGE. * Notification will be sent by e-mail. You can edit your presentation's information from meeting's MYPAGE. If you are a student who wish to give same research institution's presentation in series, registrate for consecutive presentation. Only one person from your group should make the request for consecutive presentation. Other member's presentation will also be in consecutive automatically. 2-4 Notification of Presentation No. Your presentation No. will be sent to your e-mail address around mid Dec., after the program is set. Please check the detail from meeting's MYPAGE. Create your preliminary draft in PDF file and submit from meeting's MYPAGE. * If your presentation language is set to English, your preliminary draft must be written in English also. * Except if you are invited. Make your registration during the period. ■If you have already applied for your presentation : login to meeting's MYPAGE and register from "Make Registration." ■If you have not applied for your presentation yet : Apply using the reservation acceptance form. You will be registered automatically by using this form and after it is completed, you will receive the ID and the password to login to your meeting's MYPAGE by e-mail. Use the meeting's original form which is attached in the "Kagaku-to Kogyou" (Chemistry & Chemical Industry)., or the transfer form in the post office. Don't forget to write your registration No. in the note. We will deliver your attendance certificate and collection of papers (DVD-ROM) in advance to the registrant who have completed their registration and payment until the deadline. 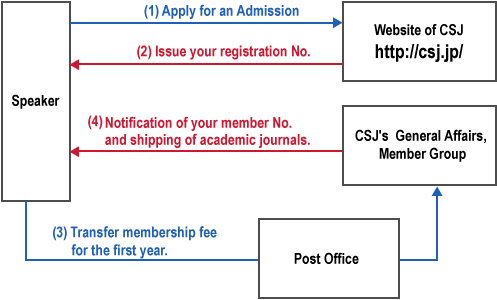 Registrant who have completed their registration and payment until the deadline will be able to use the collection of papers in website. To use the collection of papers in website, you need your registration No. and registration password. You will also be able to use the collection of papers in website, after you have registered at door.